A total eclipse of the Moon is an unusual sight that offers a beautiful play of colors and shadows on the lunar surface. Capturing it is a challenge for practically every photographer. And so we’ll advise you on what to do. As this picture proves, wide angles do have a certain magic. And there’s also no reason to fear the lights of the cities during your shoot. Lunar eclipses are among the astronomical phenomena during which you don’t need to be equipped with specialized equipment in order to watch. But if you decide to document the eclipse, prepared a nice, firm tripod. Without it you won’t have a chance of getting a good picture, especially during the full phase. 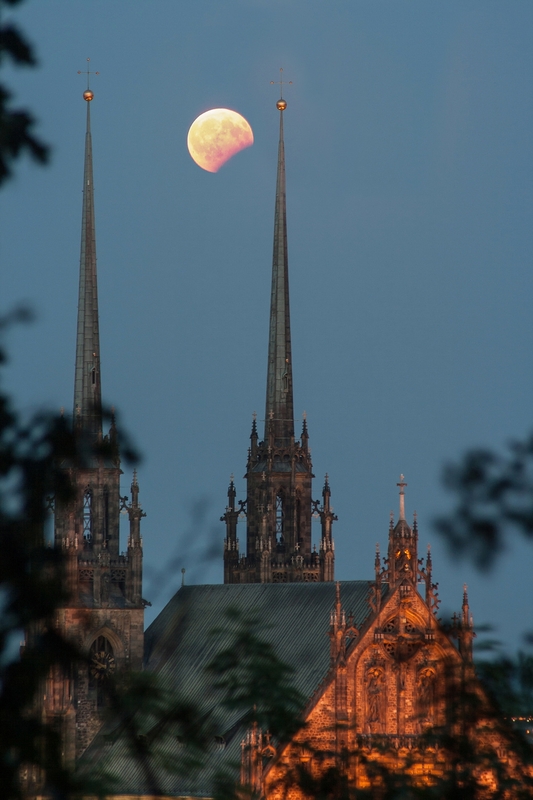 Don’t be fooled by the frequent claims that you need a long focal length to photograph the Moon. Or better yet a long lens on an astronomy mount with clockwork to compensate for the Earth’s rotation. Naturally, if you do have this equipment, be sure to make use of it. But most photographers will have a normal compact or DSLR waiting in their bag. The good news is that they can photograph lunar eclipses with these as well. This church was briefly shadowed by the bitten Moon. 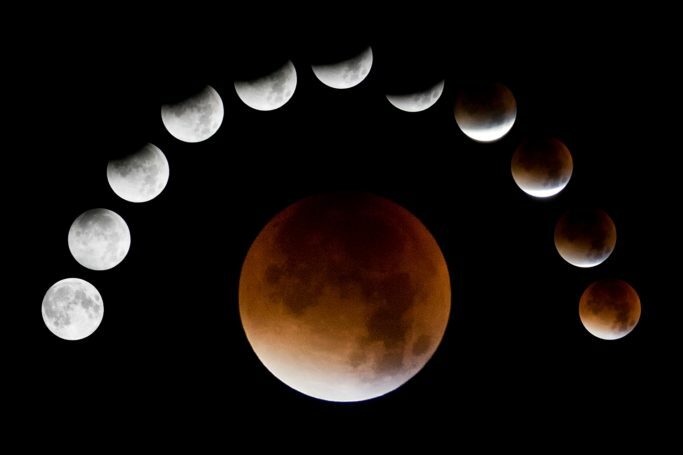 How Should You Photograph a Lunar Eclipse? In Manual Mode! 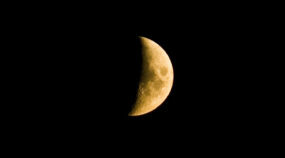 At the moment when the Moon comes out, your exposure times will be far below one second, due to the gradual darkening. Spend this period on thinking through composition, and also on testing the limits of your photographic setup. As the twilight grows and the eclipse phase advances, a tripod starts to play a more important role, especially if you’ve decided for a long focal length. When you’re looking for the right shot, try inspecting both the shooting site and the Moon a day in advance. For example a day before the full moon, the Moon moves along roughly the same track as on the day of the full moon, just one hour earlier. So when you head out to the spot you’ve picked a day before the eclipse, you can think over your composition in advance. During the shoot, pay the most attention to ensuring your focus is correct; check it repeatedly over the course of the eclipse. Once the Moon is bathed in full shadow, your autofocus may not work fully correctly. But it’s entirely enough if you just focus on any bright object in the distance. If at all possible, forget about automatic exposure mode. 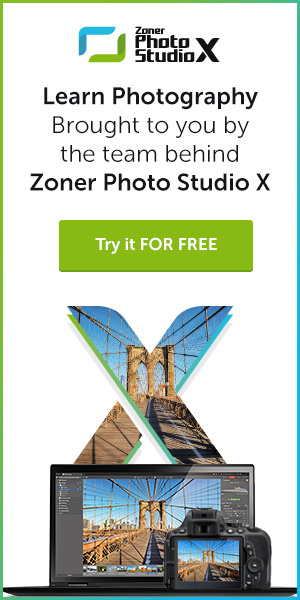 I’d venture to say that no matter what automatic exposure metering method you use, the camera’s automatic system will never be able to estimate the right amount of light to send to the sensor for this kind of shoot. A streetlight has added some flair to this otherwise ordinary shot. Don’t forget that the Moon is in motion. So start by defining for yourself the maximum exposure time that you’re willing to accept, in terms of the motion blur that it will cause. When you’re using a focal length of 250 mm, it may be up to a second, while for medium and wide shots, it can easily be up to ten times that much. Some sample exposure values can be read from the pictures in this article. To add even more light once you’ve reached the edge of the usable shot lengths, increase the ISO. You’ll also find it useful to set a high f-stop, as this will increase the detail in the scene. However, doing this will also lose you some much-needed light. This brings us back to the beginning—the loss of light needs to be handled by lengthening the exposure or increasing the ISO. But for a partial eclipse, the situation will definitely allow you to close up the aperture more. So try going about two numbers higher than the fastest lens speed for the given focal length. Also keep in mind that when you’re photographing this very special kind of scene, with a black, starry sky and a very dark Moon, you will not want to balance the histogram. Even though this may lead you to balance the moon’s light to the level of, say, a normal full moon. However, this kind of approach does have the consequence of a higher saturation for the red tones and an increased risk of reduced sharpness and stronger noise. Not to mention that a picture like this will be far from a faithful representation. There are a number of possible approaches for documenting an eclipse. Most often you’ll encounter pictures with focal lengths that are long, but do not bring the Moon in close enough for it to cover a large part of the scene. Meanwhile “mood” shots are also popular; in these the main point is good composition, with no large ambition towards catching details. I’d also like to mention the possibility of taking a series of pictures at different times and then joining them into a collage. 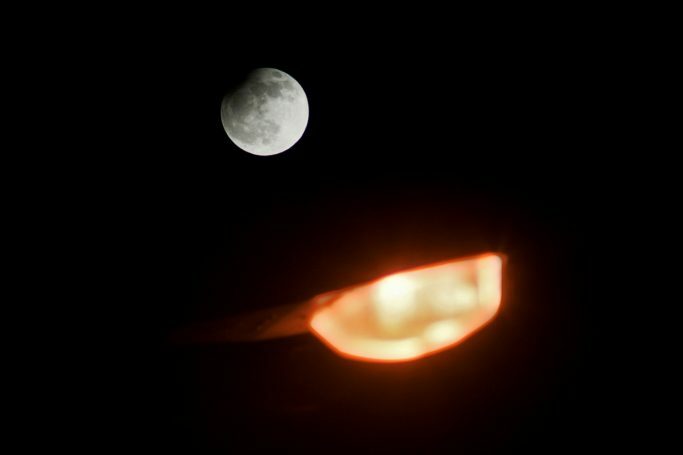 And then there are “edge” approaches such as extremely long exposures that draw the Moon’s trajectory through the sky as well as the changes in its brightness during the eclipse. The approach here is similar to what you’d use for star trails. The path from full moon to eclipse. Watch the Time and Take Your Watch! 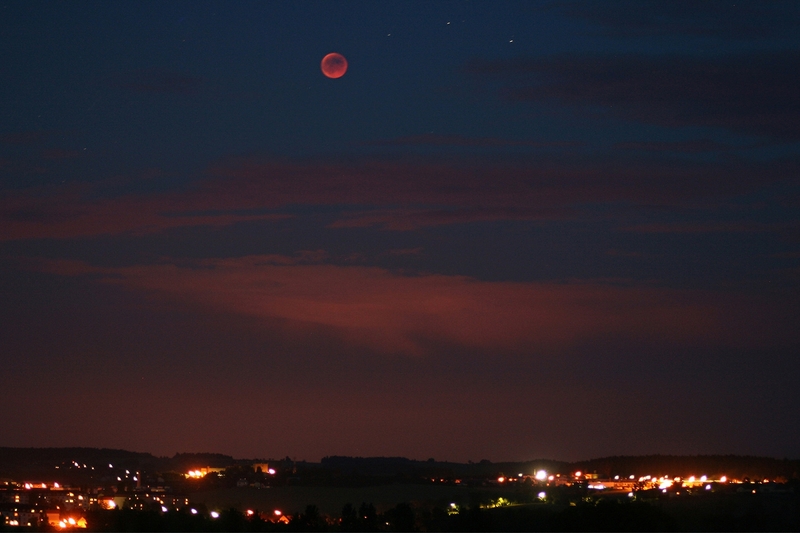 When you’re photographing a lunar eclipse, you have to think about more than just the weather. You have to think about when the eclipse starts and stops. Even though a look at an eclipse-timeline table may give you the impression that there will be plenty of time, there really isn’t. The one hour plus length of the total eclipse phase may not be enough for you to comfortably prepare. It’s true that unlike eclipses of the Sun, whose full phase generally doesn’t last longer than 5 minutes, the strikingly colored lunar disk seeped in the Earth’s full shadow is something you can enjoy for almost two hours. But that assumes that you’ll have clear skies and that your enjoyment won’t be ruined by not knowing what kind of pictures you want to take home. It definitely can’t hurt to spend some time on taking test pictures of the Moon in various phases beforehand so you’re prepared. Ideally you should connect this training with the place you plan to visit during the eclipse. In closing, here’s a recommendation that may surprise some people. Don’t spend the whole time during the eclipse on picture-taking alone. Above all, enjoy this beautiful astronomical phenomenon for yourself directly. Even if that just means a few passing glances while you’re working with your gear. No matter what approach you choose, I’m confident that on the night of January 21st, Nature herself will provide us an opportunity to take lots of breathtaking pictures.